A 48-year-old man was charged Saturday morning with four counts of first-degree murder in a shooting that left two police officers and two civilians dead in Fredericton, N.B. on Friday. Police Chief Leanne Fitch said the suspect, Matthew Vincent Raymond, was in hospital in stable condition after he was seriously wounded by police gunfire during the early-morning incident. Fitch also revealed the four victims were shot with a long gun by somebody who fired at them from an elevated position. She offered no other details. Police are still trying to understand whether there was a relationship between Raymond and the four people he is accused of killing. Const. Sara Mae Burns, 43. He will have his first court appearance on Aug. 27 and will remain in police custody until then. Police said it was up to investigators to determine what led to the shootings, and asked the public not to speculate on motives. When asked whether there was a link between the two civilian victims and the shooter, Police Deputy Chief Martin Gaudet responded that such a link has not been determined. “That is a piece of information that we are working to establish,” he said. Fitch confirmed that there were only five casualties in the incident: the two police officers and the two citizens killed, and the shooter, who was injured. RCMP have taken over the homicide investigation, Fitch said, and external officers have been called in to help provide shift relief for local police. Nova Scotia’s Serious Incident Response Team, an independent body that probes serious incidents involving police in Atlantic Canada, is also investigating. Const. Costello was a 20-year police veteran and a father of four, while Const. Burns was a two-year veteran of the police force and a married mother of three. Robichaud was a father who played bass and sang in a few local bands, and also worked in auto body shops, his cousin Sean Callahan told The Canadian Press. "The guy was so likable, like I don't think he had anybody that hated him. And Donnie, if he even hated you, he'd still give you the shirt off his back -- he would help you out," Callahan said. Jackie McLean, the common-law partner of Const. Costello, told the Canadian Press she had lived with Costello for five years, and he had two adult daughters from a previous relationship. She described him as someone who loved his job and was “the only police officer who I have ever known who could write someone a ticket and have the person thank them after." The shooting broke out around 7 a.m. local time Friday morning at an apartment complex in a north-end residential neighbourhood. Costello and Burns responded to a “shots fired” call and were the first officers on the scene. When they arrived, police said, the two civilian victims were already on the ground. At that point, police said, the two police officers were shot. Other officers arrived on the scene and instituted a lockdown and for several hours, police asked residents to stay away from the scene. Just after 11 a.m., police confirmed the lockdown was lifted, a suspect was in custody, and there was no further threat. Fredericton police said the Red Cross and the city have found lodging for 50 residents of the apartment complex who have been unable to return to their homes. They are asking anyone who captured photos or video of the incident to come forward. On Friday evening, about 100 local residents packed into St. John the Evangelist Anglican Church for a vigil for the victims. 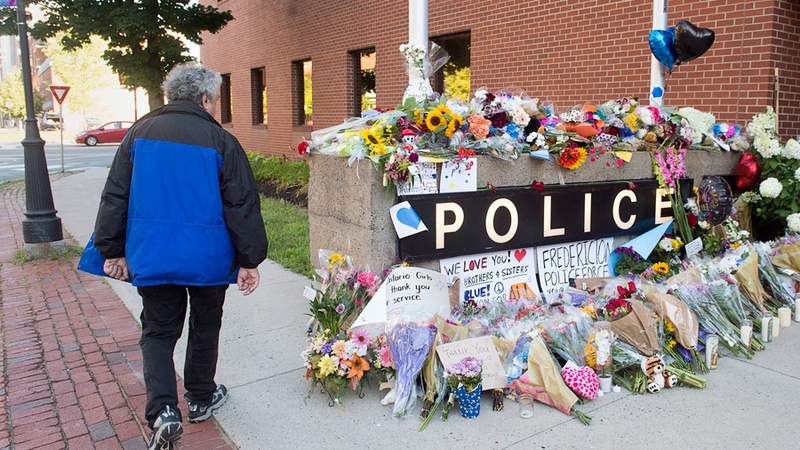 Over at the Fredericton police station, a makeshift memorial of flowers, signs and card is growing. One of the messages on the signs reads: "Fredericton Police Force, your city has your back!" Another says: "We love you our brothers and sisters in blue! Thank you for ALL that you do!" 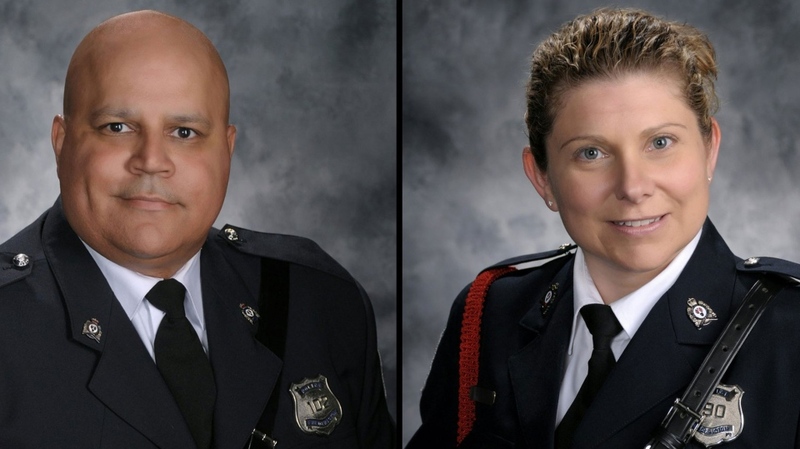 Across the country, many police forces have lowered their flags to half-mast to pay tribute to their two comrades who lost their lives in the line of duty. Prime Minister Justin Trudeau addressed the tragedy at the Taste of the Danforth Festival in Toronto Friday night. The event was held in the same neighbourhood where, just two weeks ago, a shooter killed 18-year-old Reese Fallon and 10-year-old Julianna Kozis. 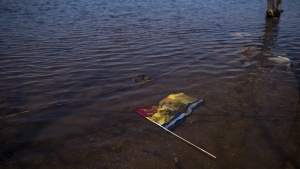 “As we remember the terrible tragedy that struck two weeks ago, the loss of life, the way the community came together, there is a great town a few hours east of here, our friends in Fredericton, who are going through a very, very difficult night,” Trudeau said. 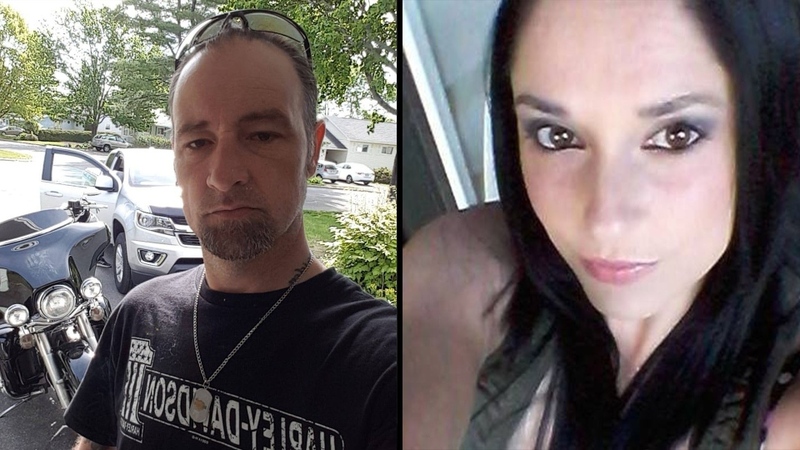 Donnie Robichaud, left, and Bobbie Lee Wright,, right, have been identified as the two civilians killed in a shooting in Fredericton, N.B. on Friday, Aug. 10, 2018. 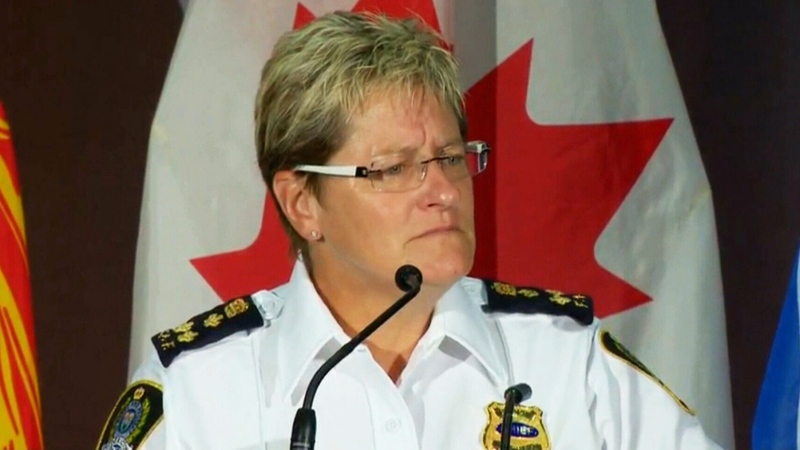 Fredericton police Chief Leanne Fitch speaks to the media on Aug. 10, 2018.